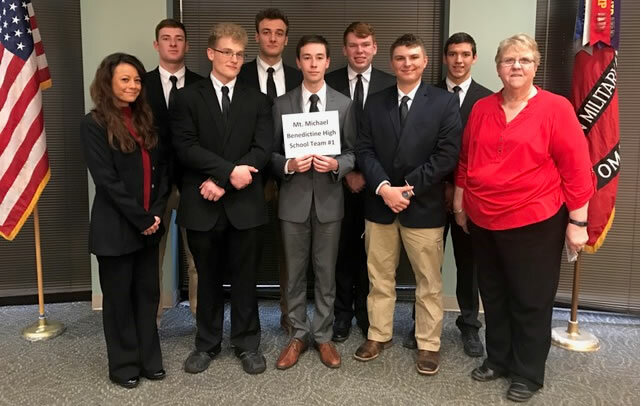 The 23rd annual Society of American Military Engineers Competition was held at the Walter Scott Conference Center at the University of Nebraska Omaha. There were 20 area high school teams involved this year. Mount Michael sent both a senior and junior team. The Senior team's project was to design an enclosed pedestrian walkway that would connect the original school building to the new D J Sokol Learning Center. The Senior Team won 3 gold and 2 silver metals giving them an Award of Distinction. This Award includes a $500. check from a sponsoring engineering firm to be used in the Drafting Program. The Senior Team was Dylan Herrmann, Sam Clements, Nathan Carpenter, Peyton Hottovy, Jack Straka, Joe Coldiron and Ian Price. The Junior Team project was to renovate Camp Mount Michael by moving it out of the school building and centering it around the pond in the northeast corner of campus. The Junior Team was made up of Colin Lakeman, Riley Kruse, Thomas Janecek, Lucas Rief, Will Fleissner, Nolan Gottsch, Luke Van Haute, John Hudson, Grant Pavlik, Nolan Huetter and Jeff Kim.